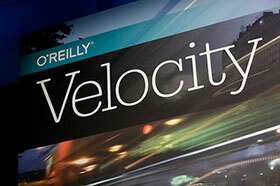 Velocity is about the people and technologies that make the Web fast, scalable, resilient, and highly available. From ecommerce to mobile to the cloud, Velocity is where the future of the Web takes shape. Is there a video of the presentation available. The slides are great, but I would love to hear some of the extra commentary. Tutorials, sessions, and keynotes will be recorded. If you would like to be notified when the Complete Video Compilation becomes available for purchase (about 3 weeks), fill out this simple form. Feel like I've learned more in 3 days than the last 3 years!" As someone completely new to the industry, I feel I gained a much better understanding of operations and web performance by attending Velocity. I can't wait to incorporate some of the new things I learned into my work." Velocity draws attendees from Fortune 500 companies to the newest, most exciting startups, all joining together for a legendary learning and networking experience. I would definitely put O'Reilly's Velocity Conferences on a must-see list for my industry segment. I was really blown away by the quality of speakers and attendees." Coming back from Velocity is like coming back from summer camp. You're amped up to try and do new things." I come to Velocity conference for ideas and I have never been disappointed. It is like meeting a good friend and asking him for advice. Thank you." –Sergei Koren Systems architect, LivePerson Inc.
Because a fast and high performing web experience isn't a feature anymore, it's an expectation. If you measure your success in milliseconds, you'll find your time well spent as you immerse yourself in the latest tools, technologies, and expert advice on getting your site to perform at warp speed. Not only do you have to keep operations running but you must act with efficiency and scale. At Velocity, you'll learn what's important to monitor and when, understand which metrics make a difference, see how some of the world's largest sites deal with config management, failover, downtime, best practices, and other key issues in the operations side of the Web. Since mobile is how your users experience the Web. Get your mobile-first strategy in place. As mobile takes center stage with consumers, user expectations have skyrocketed. At Velocity, you won't just get the tools you need to make the mobile web faster, you'll learn how to measure, analyze, and improve mobile performance, learn how UX/UI play an key role in performance, and improve operations and deployment so your apps are never out of date or unavailable. And cultural change is key to your success in all of these areas and others. Are you ready to fully embrace a culture of performance and operations in your organization? To stay resilient, manage complex systems of both the technical and human varieties, in the face of near-impossible odds? Future-proof the health of your organization with the right skills from Velocity's Culture track.